Twitter has acquired Spindle, a social startup focused on the location and check-in space, and discovering local places of interest nearby. “By joining forces with Twitter, we can do so much more to help you find interesting, timely, and useful information about what’s happening around you,” the company said. I’ve been rather interested in Spindle since I first covered the service last year. The brainchild of a group of ex-Microsoft search engineers, Spindle pitched itself as a “tacit” mobile search application. Essentially, the app sifted through the torrent of data that streamed through the social Web — from places like Facebook and Twitter — on a minute-by-minute basis, and would deliver users local points of interest like restaurants or stores based on tweets, location and time of day. 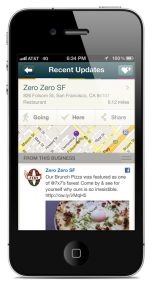 It was a way of fine-tuning the local discovery experience from the mobile device. Since Twitter is shutting down the service, I’d expect that the team of engineers will be working in a similar area focused on local discovery. Though I’d assume it’s not necessarily an apples-to-apples, Spindle-to-Twitter implementation. My guess? Twitter may focus that talent on fleshing out local discovery features to add to the microblogging service, a feature we reported that the company was testing months ago. Twitter is dabbling with how to better make use of data like location information, surrounding tweets from nearby users and points of interest that are occurring close to you. The team at Spindle seems especially well-suited for a task such as this. That’s probably something that Foursquare will want to take note of, considering the check-in-based startup has spent the past year pivoting into its own version of a local discovery app. The Spindle team will relocate from their headquarters in Boston to Twitter’s offices in San Francisco as a result of the acquisition. Terms of the deal were not disclosed.